Your windows serve many purposes; they allow you to view the world outside of your home, they allow natural light to illuminate your home, and they are supposed to do all of this while keeping your home protected from the outdoor elements. 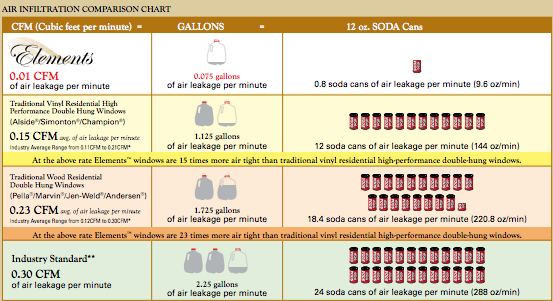 In a perfect world, windows would not allow any air to leak into or out of your home. Unfortunately we don’t live in a perfect world, and air infiltration is a very real, very irritating problem for homeowners. But there is hope! 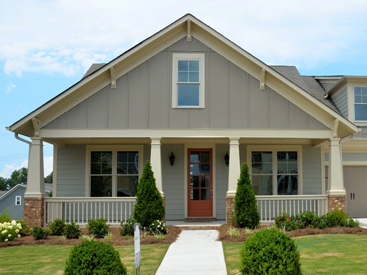 Blue Springs Siding & Windows can install SoftLite Elements windows in your Kansas City home. Here’s what to look for when purchasing airtight windows and how these high performance windows can cut down the amount of air infiltration in your home. When you’re trying to decrease the amount of air infiltration in your home, make sure to look for windows with a lower CFM. CFM stands for cubic feet per minute of air that infiltrates your home. Windows with a CFM of 1 are about equivalent to 7.5 gallons of air seeping into your home every minute. The standard industry window has a CFM of .30, or 2.25 gallons of air per minute. But Blue Springs Siding & Windows can top that. We can install SoftLite Elements windows that only have a CFM of .01, which is only equivalent to .075 gallons of air per minute. Air infiltration with these windows is virtually non-existent. But achieving such a low CFM rating and saving homeowners hundreds of dollars on energy bills every year is no easy feat. There are a lot of reasons why Elements windows are the premier choice for homeowners looking for less air infiltration. 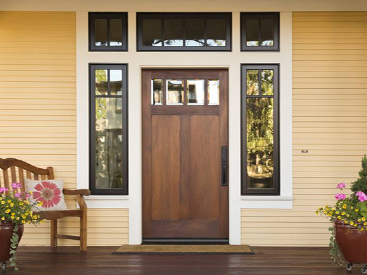 Make sure you’re keeping your eyes peeled for these features on your windows. Super spacer: A 100% foam sealing system that provides some of the best thermal performances in the industry. It dramatically reduces interior condensation on glass. 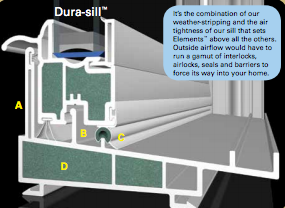 Dura-Sill – This provides exceptional air, water, and structural protection. Ultrasmart Weather Stripping – This provides extreme protection from drafts. K-Beam Thermal Reinforcement – It’s 5 times stronger than steel. 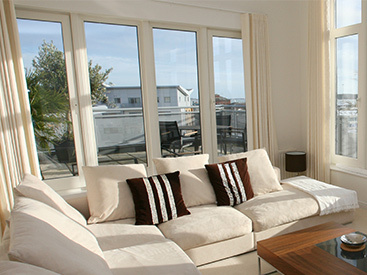 Endura-Force Balance System – Allows easy operation of the window that never requires oiling. Call Blue Springs Siding & Windows today at (816) 463-8750 0r (913) 631-2200 to install the most energy efficient windows in your home.